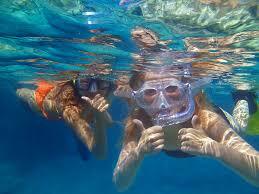 Learn to snorkel, just £25 per session. A simple, stress free, experience providing you with a supervised session, with an instructor, practicing techniques to enjoy snorkelling and observing the underwater world. The course provides basic information on snorkelling equipment, a bit ofdive science, the environment, problem management and safe snorkelling practices. reasonably comfortable in the water. The best part is learning to use your mask, fins and snorkel so you don't miss a moment of underwater action. Whether you're looking at your local freshwater lake or the big blue ocean, you'll have a new perspective on just about every body of water. Snorkelling is a superb holiday activity. The Snorkel Experience teaches you to use basic snorkeling equipment including a mask, snorkel, fins, exposure protection like a wet suit and dive weights as needed. Ask us what equipment you'll use. We have everything you need at DIVEWORLD. Contact us for a chat if you have ant quations or would like to book.